Exporter of a wide range of products which include eot cranes for steel industry. SMACO Equipments are designed for High Speed operation to give increased productivity. Precision workmanship of all components minimizes losses and increases efficiency. Gears having precision hobbed teeth which are heat-treated. Flame-Proof Crane upto 250 TON capacity for Gas group IIA, IIB & IIC are manufactured by us in accordance with IS standards. Such equipments are supplied to M/s P.D.O.- Oman, HOMS Refinery- Syria, ONGC- India & ARAMCO- Saudi Arabia. 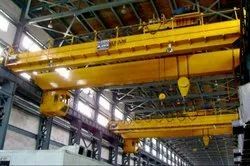 Looking for EOT Cranes for Steel Industry ?